In July 2012, the United Nations Economic and Social Council (ECOSOC) granted special consultative status to Sigma based on expertise in the field of nursing and global health. 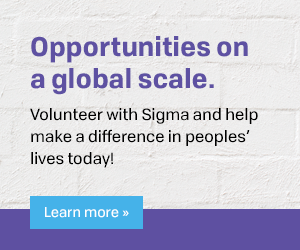 This United Nations (UN) designation recognizes Sigma’s commitment to the charter of the UN, which seeks to achieve international cooperation toward solving humanitarian issues. Special consultative status grants Sigma greater privileges and access to nearly all intergovernmental processes at the UN dealing with economic and social development. This designation allows Sigma to participate on UN committees through which Sigma has a voice. As part of this affiliation, Sigma commits to disseminate information and raise public awareness about the purposes and activities of the UN and related issues of global concern. Sigma will provide a strong nursing presence at the UN and will continue to conduct outreach around the world to help our nurse members better understand the work and aims of the UN, including the Sustainable Development Goals (SDGs). The Sustainable Development Goals (SDGs) seem so broad. Can I really make a difference? Use one of the suggestions below, or come up with your own ideas and let Sigma know what you’ve done to make a difference at global@sigmanursing.org. Search the web for keywords related to the SDGs and topics important to you (e.g., habitat, end poverty, homeless shelters, food banks, water management, etc.). Find a program where you can use your talents. Volunteer. You can make a difference. Donate your time, talent, and resources to worthy causes. Sponsor health related events in an underserved area. Start a mentoring program in your area. Partner with an appropriate hospital or clinic to help create a health-related campaign. Assemble care packages to be sent to areas in need. Take an overseas trip organized by a group with a specific health-related cause that interests you. Find a relief organization that needs nurses who can travel for short- or long-term assignments. Check your local service organization for global outreach projects.